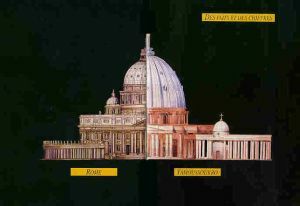 Q: How large is the Basilica Church of Our Lady of Peace? A: The basilica of Our Lady of Peace in Yamoussoukro Ivory Coast was built between 1985 and 1989; it was consecrated on September 10, 1990. John Paul II blessed the foundation stone or cornerstone on August 10, 1985. 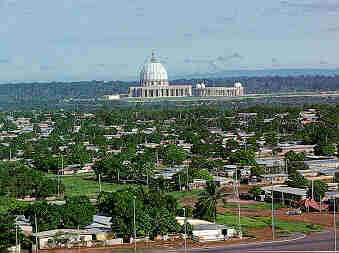 It was projected and financed by the then president of Ivory Coast, Felix Houphouet-Boigny. The basilica claims to be the highest or tallest in the world. The total height with cross is 158 m, the dome is 60 m high, its diameter (at the base) 90 m. The total surface in marble is 70,000 m2; the church has a total of 368 columns of various styles. The baldaquino above the high altar measure 28 m in height, and there are 36 surfaces of stained glass covering a total surface 7400 m2. The basilica seats 7000 people, an additional 11,000 standing in the nave, 30,000 on the plaza leading into the sanctuary, and more than 150,000 on the esplanade within the corridor of columns.